Recently I spent 5 days in China with the Ningxia Winery Association hosting masterclasses about Chinese wines in Shanghai, Nanjing, Suzhou and Hangzhou. 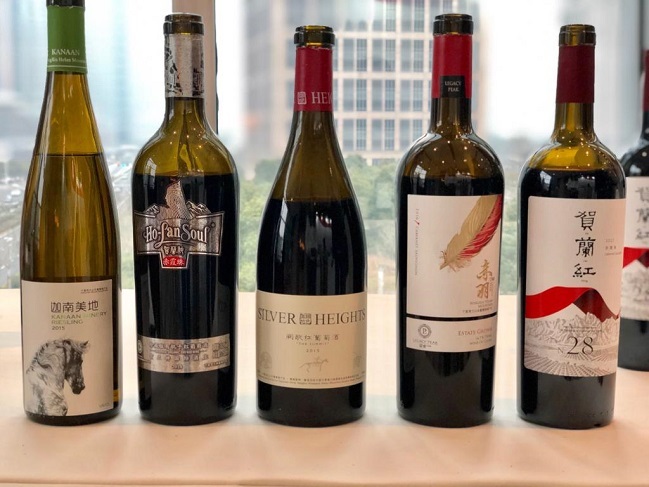 I had the opportunity to try over 35 Chinese wines and I came away very impressed with the increasing improvement in quality and the diversity of wines that are now being made in China. While the main grape variety is still Cabernet Sauvignon, which is the most widely planted grape variety, there is a lot of experimentation including successful examples of Syrah, Cabernet Franc and Merlot, not just as blending varieties but single varieties that stand on their own. A delicious Cabernet Franc that has all the characters one would expect from this variety – savory earthy flavors, roasted herbs, blackberry fruit, green pepper and sweet ripe red plums. An elegant, balanced Cabernet Franc that is drinking well now. Impressed to find this variety doing so well in Ningxia. This is a suave, beautifully textured red wine made from 100% organic Cabernet Sauvignon grapes. Good intensity and depth of dark berry fruit, cocoa beans and cedar. Great flavor concentration and depth makes this a serious Cabernet with a seriously high price tag (1800 RMB OR US$250 per bottle). Very pretty, elegant red from Silver Heghts. Aromatic and velvety made from 60% Cabernet Sauvignon and 40% Merlot. Beautiful nose of cedar, violets and sweet red plums. Balanced, and medium bodied and light on the palate despite having 14% alcohol. Always one of my favorite go-to reds from Ningxia from the talented Emma Gao. Well crafted, balanced Cabernet blend with a wonderful array of spices that comes from the 20% Carmenere in the blend. Tannins are suave and supple with fresh acidity in the background. A delicious, well made wine that should age well for at least 5-8 years. I have always been impressed with the wines from Zhi Hui Yuan Shi and I am happy to see that they are continuing to make wonderful wines. Well made Cabernet Sauvignon with supple tannins and a wonderful elegance. The palate is balanced with crunchy, fresh blackcurrants, dark cherries and savory herbs. Not intense or very concentrated, rather a wine to enjoy in its youth. Fairly long finish. Well-crafted Cabernet blend with wonderful layers of flavors that range from blackberries, cedar and spices to dried Chinese herbs. Tannins are chalky and well handled and the finish is modest rather than long. At its peak now. Made from 20 year old vines which are considered mature and old for Ningxia. Wonderful balance in this full bodied, restrained Cabernet with good variety expression: green pepper, cedar, red dates and earth. Tannins are well handled, dusty in the finish and the wine has a nice savory finish. Ready to drink now. A lovely Shiraz that shows cool climate characteristics of black pepper and dark spices. There are plenty of ripe dark plum flavors on the palate along with firm, ripe tannis. Balanced and open with generosity without any heaviness. Fairly long finish. A balanced, round, seamless Merlot that has supple, smooth tannins and gentle cedar and plum fruit. Harmonious, without any harsh edges and ready to enjoy now at 6 years old. Very pretty, elegant sparkling from Chandon China. Ripe citrus and apricot fruit is well balanced with a touch of sweetness in the finish. Fine mousse with small bubbles – lively, enjoyable, balanced sparkling wine from China.